Join DTSF as the organization celebrates 30 years! Downtown Sioux Falls, Inc. (DTSF) has been boldly leading the downtown community for 30 years. 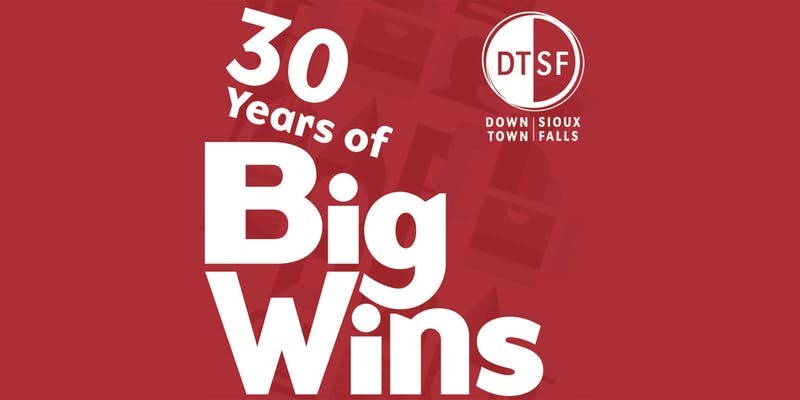 On February 26, 2019, we’re looking back at the big wins from not only 2018, but the past 30 years at the DTSF Annual Meeting. Enjoy hors d’oeuvres from Chef Dominique’s and a cash bar from 4:30pm until 5:30pm in the historic Sioux Falls State Theatre. The meeting begins at 5:30pm and includes a panel discussion with the current and past Executive Directors of DTSF: Daniel Statema, Joe Bartmann, Carole Pagones, and Joe Batcheller. The evening will also include the presentation of DTSF awards, given to leaders and visionaries in the downtown community. The three awards being presented are the Steve Metli Visionary Award, Carole Pagones Vitality Award, and Spirit of Downtown Award. After the presentation, experience an exclusive tour of the Sioux Falls State Theatre! Please register so we have accurate food and beverage counts.